A growing outcry against single-use plastic and the burgeoning amounts of plastic found in Canadian environments is spurring an ever-broading, grassroots sustainability movement. 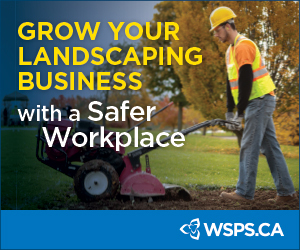 Our greenhouse, nursery, garden centre, and landscaping industries have largely flown under the public radar, but it won’t be long before customers and clients start sounding an alarm about our industry and single-use plastics — plant pots and trays, nursery containers, bale wraps for growing substrates, plant sleeves, plant labels, IPM signs, trunk liners, greenhouse film, plastic mulch, fertilizer bags, irrigation drip systems, and much more. It’s time to step up and do our part toward a more sustainable future. For decades, developed countries shipped plastic waste to China and other Asian countries. In 2018, China closed the door because “much of the plastic waste was low quality and adding to China’s mounting health and environmental problems,” reported Laura Parker and Kennedy Elliott for National Geographic. Joe Hruska, V.P. Sustainability for the Canadian Plastics Industry Association (CPIA), suggests that Canadians should produce less-contaminated recyclable products that China would accept or follow the British Columbia model. In B.C., all plastic recycling is handled by a not-for-profit organization, Recycle BC, and costs are covered by businesses in the province that are deemed to create waste packaging or products. Soil and debris stuck to pots and greenhouse films is a serious cause of batch contamination, leading to extra sorting. Cleaning pots for recycling is a challenge. Mobile cleaning and baling equipment can be used on-site for large-scale cleaning of #4 greenhouse films. Some portable, plastic-baler machines can also crush nursery pots and process drip tape. Metal basket hangers or metal clips used to secure plant tags can also contaminate batches. It’s important to separate plastic pots with different recycling codes, such as #2 and #5, otherwise they can contaminate the batch by melting at different speeds or not melting at all. Natural Impressions Landscaping is a small landscaping firm near Ottawa, Ont., specializing in regenerative and sustainable horticultural practices. Founder Andrew Burgess has put a lot of thought into dealing with pots in a sustainable way. Burgess loves the large 5-10 gallon containers. These sturdy containers are used on job sites to transport compost, soils and mulch. For plant maintenance, teams use the containers as weeding buckets or to hold plant debris. He also uses pots to hold and transport pruners and other tools. To reduce the amount of plastic going to the landfill, Andrew also reuses plastic plant tags. He puts the plant tags in clear binder pages to make flip books for staff reference and to help new employees learn plant ID and characteristics. He explains all pots are separated by size. Some are sold to hobby farmers or other growers. Seed trays are returned to his growers, and small pots are kept for seedling production and given to schools for plant propagation projects. Quite Nature has recently sent skids of pots back to its nursery supplier. Dorman says labour is needed to sort, clean, and shrink-wrap the skids. She feels it isn’t right that it costs time and money to return the pots, and concedes most staff don’t take time to sort and clean pots once back from a job site. Landscape Ontario’s Denis Flanagan notes several Ontario growers have met to discuss alternatives to plastic. He says, “Different types of pots such as coconut fibre, peat, various paper products, etc. were trialed but all proved not to have a long enough shelf life. Other solutions were discussed such as returning pots and containers to growers for cleaning, developing recyclable plastic products and developing new machinery, and again it was concluded that all options would be expensive.” The big unknown was if consumers would accept price increases to cover the new costs. Alternative products for horticulture include pots, trays and twine made of starch, rice hulls, bamboo pulp residue, cow manure, compressed peat, paper, coconut husks and coir and even a “natural plastic” bio polymer made from plant sugars. Standardized pot sizes would help make reuse and recycling easier, since the variety of nursery pot sizes makes sorting and stacking both time-consuming and inefficient. And a mandate that all plastic pots must be recyclable and marked with large, highly visible recycling codes would encourage more recycling. Lisa McLean of AgInnovation Ontario concedes the greenhouse sector remains a high user of plastic, especially the small clips that support tomato plants. These clips often remain on plants at the end of the season, and contaminate organic waste. Now in development are compostable plant clips made with “a new biocomposite resin that combines biodegradable plastics with agricultural residues, such as soy hulls or oat hulls,” says Prof. Manjusri Misra of the University of Guelph. HerkuPlast Internationals, based in Germany and the Netherlands, makes QuickPot and HerkuPak products from heavy-duty, rigid, reusable polystyrene (HIPS #6). 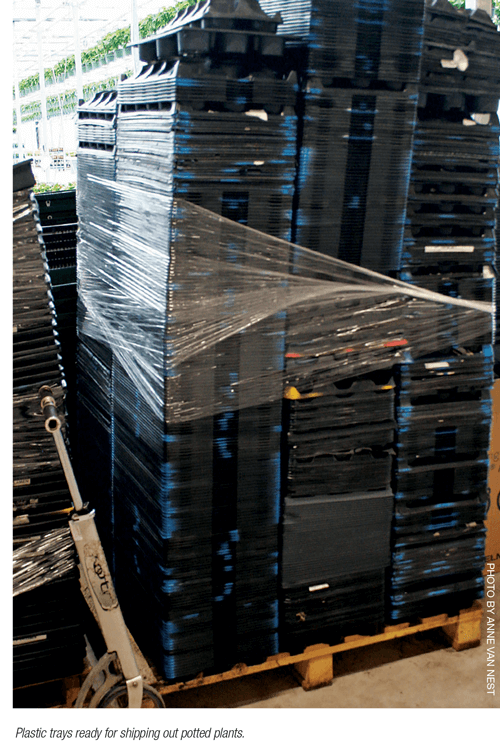 These propagating flats and trays are designed to last 8-10 years and be recycled. Sales director Alfred Boot says they are about three times the price of single-use plastics, but are much more sustainable and economical in the long term. Horticulture professionals agree on the urgency of solving the plastics problem. Will it come from grassroots efforts, new technology or a shift in global economies? Stay tuned. Anne Marie Van Nest is a freelance garden writer, a member of the Garden Writers Association Sustainability Committee and a greenhouse grower at Niagara Parks.